Listen to this track by taboo-bating, industry-undercutting, Malcolm McLaren-abetted punk-pop band Bow Wow Wow. It’s “C30 C60 C90 Go”, their 1980 single that stands as an ode to creative music collecting. The song showcases the band as an amalgam of punk, pop, and Burundi drumming, which (Adam & The Ants notwithstanding) was something of a unique approach by the early ’80s. But, they also managed to incorporate surf music, and Latin American music into their songs, all of which were aimed at a pop audience. They had a sound of their own to say the least. The band features then 14-year old singer Annabella Lwin, which adds a bit of realism to the tale of a young record buying fan who, tired of the records she wants not being accessible to her, chooses to (!) tape them instead. This song would represent one of many controversies that the band stirred up during their relatively short initial run in the early 1980s. But, is this song a really a political tune made to stir up controversy? Why would an up and coming band record a song about not buying music unless they were trying to shoot themselves in the foot? “C30 C60 C90 Go” was released (perhaps appropriately) on cassette only in the summer of 1980, the first song ever to be released this way. The B-Side of the single was blank, presumably so the fan who bought it could tape any other song they wanted onto it. Their label EMI weren’t too pleased about the song’s subject matter. But, the single charted on the UK top forty, stayed there for several weeks, and has since become a part of new wave compilations for years afterwards. Not bad for a song about not buying music. This is a song that’s certainly of its time for the references to cassette tape technology. Not too many people under a certain age today even know what C30, C60, or C90 even means. But, in some ways the theme is pretty timeless. The impulse to get around the usual channels in acquiring music, or perhaps seizing control of new channels, would continue to be relevant in the 21st century, as we all know. In the 2000s, the conflicts between record companies and fans (many of whom were also teenagers) can certainly be seen as an extension of the Home Taping Is Killing Music campaign in the early ’80s. The only difference is the technology. But despite the legalities and social phenomena that the technology of the times enabled, I’m not so sure that Bow Wow Wow were making any sort of political statement with this tune anyway. To me, it’s a story with a very strong central character, perfectly portrayed by Lwin. She happened to be the exact age of the audience the band were trying to reach, so it comes off as a genuine, and straightforward pop song that speaks for that audience. Many members of that particular audience engaged in the very activities being described in the song. So, it’s not necessarily a call to arms to stick it to the Man and not buy music. It’s just a song about what was happening. And as for the practice of taping music onto blank c30, c60, c90 cassette tapes, and making mix tapes to be shared between fans, this would very much feed a number of underground movements that the record companies would only find out about, and greatly profit from, later. For instance, the rise in popularity of hip hop can be directly traced to mixtape culture. The same goes for grunge in the late ’80s and early ’90s. It seemed that home taping didn’t kill music after all. In fact, music was fed by it. Bow Wow Wow went through several phases and line-ups from the early ’80s to the early 2000s. But, they are an active band today, with Annabelle Lwin still fronting them when she’s not singing on her own as a solo artist. Original bassist Leigh Gorman is also a fixture. They have since been joined by No Doubt drummer Adrian Young, who was influenced by the band when he was also a teenaged music fan, and probably taping songs off the radio. 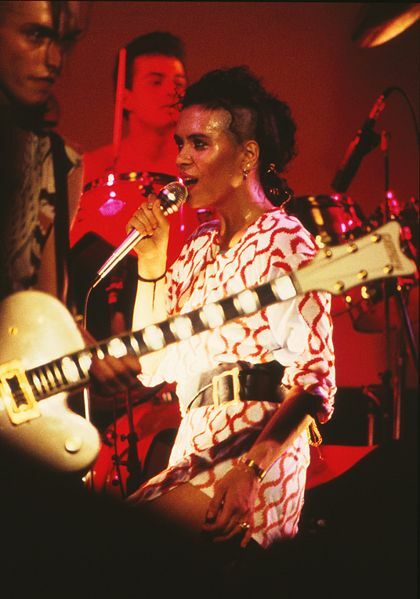 To learn more about the band then and now, take a read of this history of Bow Wow Wow and interview with Annabella Lwin. I thought Annabella was the coolest. thing. ever. I wanted to be her. I didn’t know Adrian Young was drumming for them. Good fit. Annabella always seemed like one of the cool kids, for sure. Sometime during grade 7 or 8 or so, she began to make me feel kinda … funny. But, in a good way.